Ibrahim Sarsour, an Israeli-Arab Knesset Member, calls for Islamic Caliphate centered in Jerusalem, and praises Hizbullah for defeating Israel. Ibrahim Sarsour, an Israeli-Arab Knesset Member, calls to establish Islamic Caliphate centered in Jerusalem and praises Hizbullah for defeating Israel. Israeli-Arab MKs have long been accused of spouting anti-Israel rhetoric, but it appears that Sarsour, a seemingly mild-mannered Knesset Member and leader of the Ra’am-Ta’al United Arab List party, has now gone further than most. In a recent speech – in Arabic – at Abdul Rahman’s club in Israel, Sarsour actually lauded Hizbullah, a Lebanese terrorist organization bent on vanquishing Israel, for having “defeated” Israel in the Second Lebanon War in 2006. He also encouraged Hizbullah to continue working to this end in the future. 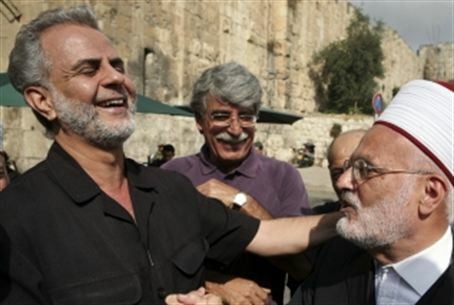 The speech was reported on and translated into English by Walid Shoebat, a former PLO member who converted to Christianity and is a strong critic of militant Islam. Shoebat says that MK Sarsour also called in his speech for the establishment of an Islamic Caliphate centered in Jerusalem. Referring to the 2006 War, Sarsour said, “Then came the blow that ended in the humiliation, through these fighters grinding the nose in the dirt of the number-one power in the Middle East, that is Israel. This defeat caused an earthquake measuring 10 on the Richter scale and on the political scale in Israel. The aftershocks continue from this great earthquake of 2006 until today. There was none left [without humiliation] from the Defense Minister, Interior Minister and Prime Minister!" Shoebat: Kahane No, Sarsour Yes?